Eighteenth and nineteenth century physical science had completed and embellished the “golden age of a mechanistic and deterministic models of the universe” where the universe and its constituents are ruled by rigid interactive forces that can be measured, phenomena that can be predicted using mathematical tools, and where the universe or any system operating within it is made of the sum of its parts. Light was thought to be an electromagnetic wave vibrating in an undetected, and later experimentally disproved media: “the ether”, at certain rates of vibration that would define its color. It was part of the electromagnetic wave spectrum that allowed one to perceive an electromagnetic wave as heat, light , radio waves, or other electromagnetic radiations depending on the frequency of its vibrations. This spectrum had been well-defined by the equations of the English physicist James Clerk Maxwell in 1864. Man’s biology was reduced to a mechanical system albeit of extreme complexity, and thought was perceived to be but an epiphenomenon of the mechanical brain. All this was very hygienic, logical, and comforting. It allowed to view the so-called invisible world of spiritual forces or entities as a personal unproven hypothesis, and permitted the justification of atheistic concept to be scientifically sound. Basically it allowed for purely atheistic politico-philosophies alike communism to find a sympathetic resonance within the “intelligentsia” and the masses. It also gave a great mechanistic impetus and approach to the fields of biology, microbiology, psychology, neurobiology, and the allopathic technical mechanistic approach to the health/medical sciences. Technology was “king” and the understanding of interactions between well-defined separated systems would bring the possible conquest of disturbances and imperfections in the “machinery” of biological entities. Man having created a new religion called “science”, which revered himself and his intellect, had the perception of having attained a Godlike control over nature. By the end of 19th century the ultraviolet catastrophe – as it came to be known – put this whole hygienic view of the world in question, and the theory of “quanta” of Max Planck was introduced in 1900. The German physicist Max Planck introduced the notion of packets of energy that he called “quanta” in order to explain why the wavelength (color) of the radiation given off by heated objects did not rise in a continuous manner but in discontinuous spurts from value to value as they grew hotter. Danish physicist Niels Bohr, who was to become later one of the fathers of the “Manhattan Project” that developed the first US A-bomb during WWII, used in 1913 the theory of “quanta” of energy in order to prove that the whole world of atoms was full of “quantum” jumps. An electron could jump from one level of energy (so-called orbit) to another without appearing in-between these states. Discontinuity had been introduced in our equation of the universe! In 1905 Albert Einstein defined light as made of quanta of energy or particles that he coined “photons” in his famous paper explaining the photoelectric effect for which he received a Nobel prize in 1923. He nevertheless acknowledged that light could also be defined as a wave, depending on the mode of observation used in a chosen experiment, and the particle/wave duality was introduced in our attempts to grasp the mysteries of nature. The new physics of the beginnings of the twentieth century gave a mortal blow to the deterministic principles of the old school of thought. Time and space became relative notions according to the theory of relativity of Albert Einstein. Quantum physics stated that all particles of matter could be viewed either as material bodies or as waves. It allowed for one electron (or any other particle) to be in two locations at once (double slit experiment), and proved that one could not predict the next location of a particle by knowing its present one. In the strange world of quantum physics, particles dematerialized themselves into waves (such as in transistors) and rematerialized themselves later into particles. This depended on the type of experiment they were subjected to, and most importantly: the choice made by a conscious observer as to how he or she would view these particles. To most theorists, the phenomena of nature existed only as determined states as a conscious observer witnessed them, either directly, or through the artifacts of a measuring device. Quantum mechanics was born, and with it our view of reality would be forever changed. In order to comprehend events in the phenomenal world, one needed to introduce a major variable that had until then been ignored: The consciousness (self reflective thought) of the observer. Without the perception of a material world by a conscious entity, there were great doubts as to the existence of that material reality independently of its observation. In other words we make a potential reality manifest itself by our choices, even retroactively through time and immediately across the perceived infinite space, as the two experiments mentioned hereafter have proven, to the surprise of most physicists. Or, in other words, volition and free will operate outside the confines of time/space, and our impression of making choices is but a delayed awareness of events that higher levels of our minds have already made for us and therefore project to our awareness (ego) as a holographic packet of sensory information, post facto. We are therefore, at a higher level, the maker (subject) of our reality projected to one’s self (object) within the web of probabilities of the quantum world that we “materialize” for both the subject and the object that are but two mirrors of one same reality: Consciousness, defined as self -reflective awareness. Very advanced “remote viewers” know at which points volition is part of the higher levels of one’s self and at which points it is made available to the lower (conscious level), as the quantum self or higher self merges with the lower self (ego). Our courses attempts to allow the conscious part (reactive sensory apparatus operating as intellect) and the much higher vibratory mind (deep subconscious level) to merge with each other in awareness in order to allow a human individual to be more in control of one’s reality and probable future. At the level of the higher mind time/space is instantly bridged. 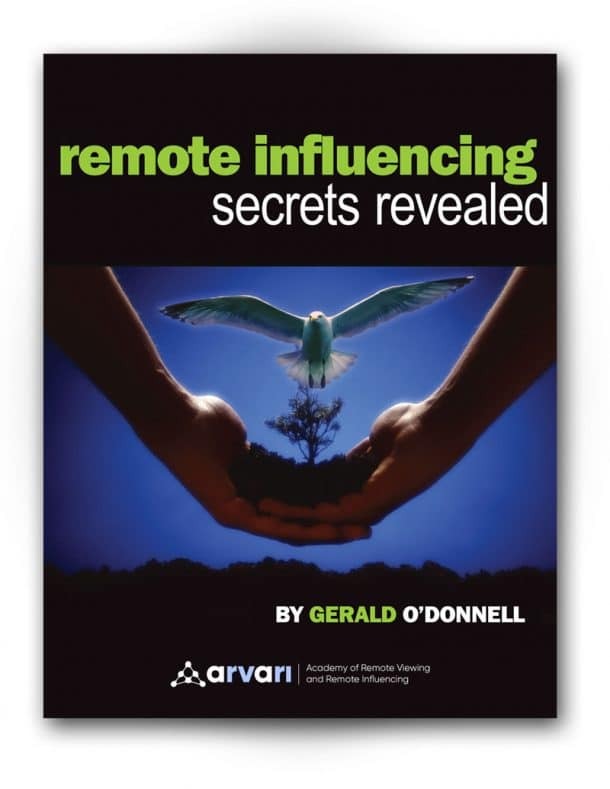 “Remote Viewing” and especially “Remote Influencing” allows one to connect to that level. Mr. O’Donnell only mentions quantum physics in order to allow for the comforting view of reality of most individuals to be shattered and at the very least questioned. Each one is to find his or her own truth, using eventually his or her own path. The course is only meant as a guide to a new world, an opening to a new way of viewing and experiencing reality. In 1982 at the Institute of Applied Physics and Theoretical Optics at the University of Paris, France, the team of physicists composed of Alain Aspect, Jean Dalibard and Gerard Roger made what may prove to be the greatest scientific discovery of this century. They proved experimentally that the world is non-local or non-separable. This is equivalent to saying that space, as we perceive it to be, does not exist, but is an illusion of our senses. Projected by whom? This is the big question that science tries to answer. In the same field of quantum theory, time is not only relative but one can experimentally change the past, as the delayed choice experiment, carried out by scientists in the 80’s at the University of Maryland and the University of Munich has proven. Although this all seems to belong to the realm of science-fiction, it is a reality, albeit hard to accept, for all the minds that dwell in the world of the quanta: a world full of seemingly contradictions, surprises, and a certain sense of humor. All modern disciplines are nowadays affected by it, short maybe of modern biology, neurobiology and surprisingly psychology that are still embracing a mechanistic view of thought and have not, as yet, been able to define it. Quantum physics gave us the invention of the atomic bomb, the transistor, the computer chip, laser and devices using laser light as a conduct for information, Josephson junctions in supercomputers, superconductors etc. You should never doubt your natural-born ability to operate at such a high vibratory level of thought. This ability has been proven since antiquity, and is still utilized successfully by highly secretive intelligence units belonging to the major world powers. This is one case where a dose of skepticism in the field of thought orientation and exploration is unhealthy, and the fear of ridicule even more so. You have to become open-minded, as a child is. All major shifts in scientific thought have incurred the ire of the static-minded old Praetorian Guard of proven inadequate sclerotic systems that are beginning to hit too many walls loaded with points of singularity. The methods taught in our courses are probably part of the dawn of a new paradigm shift in scientific thinking that will revolutionize and change the “old classical scientific concepts” of the late 19th century that still rule for most of us our interpretation of our perceived material reality. This will have major implications in the natural and health sciences, the biological perceptions and their assumed correlations, all other phenomenal science, and the understanding of what the mind is. If we are in the process of constantly creating our reality by thinking about it in an individualized and global manner, and that science reflects but a snapshot of our attempt at understanding our Creation, a major shift in our thought- perception will induce totally different ways at experiencing the phenomenal world and controlling it to our desires. All aspects of our lives in this new Millennium will, most likely, be profoundly transformed by it. The introduction of consciousness as a major factor in the equation of reality by modern quantum physics is at the core of one of the major paradox of so-called psychic research. According to quantum physics, the thought of the observer has an influence upon the result of an experiment. Therefore, if we are co-creator of our reality by mere thought, the natural imbued skepticism of many scientists and their methodologies introduce a negative bias in the results that they would obtain in thought experiment such as “remote viewing” etc. In other words, in order to achieve 100% success at proving the efficacy of “remote viewing or influencing ” one would need to deal with scientists and tests subjects that are of the firm belief of the easy achievement of such mental feats, which would automatically be called a bias experimental protocol by the skeptical scientific community. That is why the best results at remote viewing were always achieved within intelligence and military secret units that pragmatically only cared about bridging time and space effectively using mental technologies, and were not the least concerned about peer recognition and the fear of being ridiculed. Mr. O’Donnell wants to categorically state the followings: All the practical beneficial results of operating at such a high vibratory state of the mind, of which he singles out only a portion thereof below, are and were known to so-called shamans, yogis, ancient cultures, monks, Kabbalists etc. Many have unfortunately solely used it to insure a sense of power and control over other human beings. This is not the stated purpose of our remote viewing course and especially of our Remote Influencing training. Every individual of mankind can easily reach these states that, as a matter of fact, are close to the state where each infant is a birth, when the conscious and the subconscious mind are not yet well perceptually separated and when Theta (4 to 7 cycles per second) and Alpha (8 to 13 cycles per second) waves predominate in the E.E.G. tracing of the infant’s brain. Operating at a low Theta state (around 4.5 to 5 cycles per seconds) with retained full awareness seems to be correlated with highly successful remote viewing abilities. It is Mr. O’Donnell contention that the lower the frequency at which most of the brain’s cortex operates, the lesser it filters out messages from the deep unconscious where neither time nor space exists. A realm that one of the greatest quantum physicist of our century, David Bohm, called the Implicate order: indivisible and mirror image of our reality. This is the domain of the delta level: less than 4 Hz (vibrations per second) of the cortical region. This is not magic: black or white. The spiritual aspect and the comprehension of what is happening is within every human being. Each and everyone has access to it. Quantum physics has only brushed experimentally the big question: has matter created mind or mind created matter? Even though the later is strongly hinted at, the real proof is within the laboratory of one’s own mind. Not within an external technological laboratory apparatus. Although time and space have been experimentally bridged within major research physics labs recently, the implications have yet to seep through and into mankind’s psyche. In the famous laboratory experiment of modern quantum physics called “the delayed choice experiment” even the past was changed in order to fit the present. Which means that instead of the normal cause-and-effect logic that we are accustomed to, in that case the effect chosen caused the cause to change accordingly. This means that our present choices changes the memory of our past. This original experiment first proposed by the physicist John A. Wheeler in 1978 as a thought experiment, was confirmed experimentally in 1988 under strict laboratory conditions using electronic, ultrafast pocket cells, by two groups of physicists working at the University of Maryland and at the University of Munich. By correlation , one can say that since our only lived reality is the present, and that we live neither in the perceived past or the probable future, changing the “memory ” we have of either the past or the future greatly influence our reality of the “now”. This is explained in basic terms in the course, and will be developed further in more advance courses, especially for advanced students that perceive it . Undoubtedly, the most important realization about the nature of reality in the history of mankind was made and proven through a series of experiments conducted at the University of Paris-south in 1982 by a team of optical physicists led by Alain Aspect. These experiments, using high speed switching mechanisms and photons (particles of light) produced by mercury vapor, proved without the shadow of a doubt that the famous mathematical inequality of the theorem of John Bell published in 1964 had indeed been violated. This expressed for the average person, not versed in the highly complex world of quantum mechanics which gave us the transistor, computers , superconductivity etc…., that space is “non-local” which means that it is illusory and the world is not composed of objects that added together form the Universe. Rather, the “subject” viewing the “object” form an indivisible whole where everything is related, and everyone influence everyone and everything else. In other words, there exists a realm outside of space/time where all events of the fundamental processes of nature and life per se operate outside of space/time but generate perceived realities within space/time. Non-locality means that this domain is everywhere and nowhere in particular , everywhen and nowhen. It is nowhere and now&here. Although this is a truism within the physical sciences, many branches of science still hold dearly to 19th century classical mechanics, and fearing the profound spiritual implications of this reality, are still happily creative in a dangerous cul-de-sac, without long-term vision. It is great time to go back to the basics and walk back the illusion and enslavement that we created within technological quasi-religious beliefs. Therefore, use the methods given to fashion to yourselves a better present and future. Create and decide to be HAPPY! Everything will unfold from then on, and trust will replace fear for the betterment of all. Gerald O’Donnell on RECENT ADVANCES AND RESEARCH in the Perception of Space/Time reality. An attempt to explain the Remote Viewing and Remote Influencing (Thought manifestation) Phenomenon.